GUANGZHOU, Aug. 26 (Xinhua) — Chilean businessman Roberto Astete has had the same dream for the past years: used plastic cutlery at a diner are automatically sorted into small grinders, then the debris dissolves in water in just a few minutes and is flushed away. “We don’t need to collect, transport and dispose of plastic waste at special facilities anymore. They can be processed easily on site to reduce ocean pollution,” Astete explained. These days, his dream is almost a reality thanks to a new material and processing technology from his Chinese partner. In late July, Astete’s company Solubag and Polye Materials in south China’s Guangdong Province jointly launched a series of soluble shopping bags in Santiago, capital of Chile, right before the country enacted a new law barring businesses from giving out plastic bags to customers. It takes centuries for petrochemical plastic bags to degrade in the ocean, choking marine animals and harming the entire ecosystem. The bag introduced by the two companies dissolves in water quickly, and Astete even drank the mixture during a press conference to endorse its safety. According to Chen Gang, chairman of Polyrocks Chemical, Polye’s parent firm, the bag’s raw material is modified Polyvinyl Alcohol, or PVA, which comes from natural gas or calcium carbide. PVA has been used in paint, glue and textile manufacturing since the 1930s. PVA film has also been widely used for packaging in recent years. However, it was difficult and costly to process this material into shopping bags due to its lack of thermoplasticity, said Cui Yuefei, the bag’s inventor and a senior engineer with the South China University of Technology. Cui had spent years on modifying PVA in laboratories and completed his experiments in 2008. By adding certain agents, he made it easier for the material to be pelleted, blow-molded and made into bags. The researcher’s work caught the attention of Polyrocks, a reputed fire retardant producer that was trying to explore new business ventures. They joined hands in modified PVA industrialization in 2015. At that time, the Chilean had been searching for a company capable of and interested in making affordable water soluble bags around the world for over two years. Cui and Polyrocks first focused on hot water soluble bags, which would be more durable for everyday use. But Astete, coming from a country with a long coastline, insisted that the bags should be soluble in cold water. “The Chilean helped us make this crucial decision in product development,” Cui said. A prototype was produced in just two months, and Polye Materials was soon established for the project. Li Lingyu, general manager of Polye told Xinhua that the company’s yearly capacity of modified PVA pellets will reach 10,000 tonnes by November. “That’s about 500 million water soluble bags,” she said. Astete hopes the bags will hit the shelves in Chile by the end of this year and has been trying to persuade his Chinese partner to open factories in his country. Polye and Solubag plan to start a joint venture in Hong Kong to deal with sales in the global market. 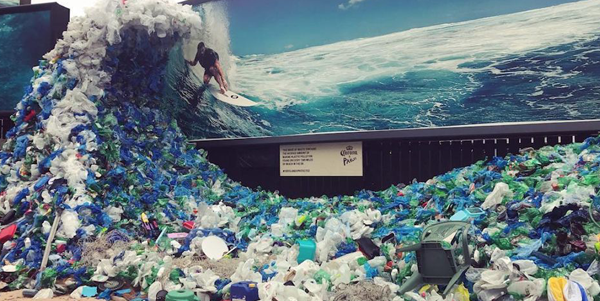 Plastic pollution is considered a major threat to oceans worldwide. At this year’s World Ocean’s Day on June 8, Antonio Guterres, Secretary-General of the United Nations, called on the world to stop plastic pollution from contaminating the world’s oceans. Eighty percent of all pollution in the sea comes from the land, including some eight million tonnes of plastic waste each year, which have resulted in the deaths of one million seabirds and 100,000 marine mammals. Besides Chile, Britain is set to ban all sales of single-use plastics, including plastic straws and cotton swabs. Kenya and Morocco also have similar restrictions.